Compare pricing for limo service in Coconut Grove, FL. Car service, transportation and limo rentals near Coconut Grove. Price4Limo has over 12,000 vehicles in our inventory with photos and prices for you to choose for your transportation needs. Getting a free quote takes less than 30 seconds and no email is required! 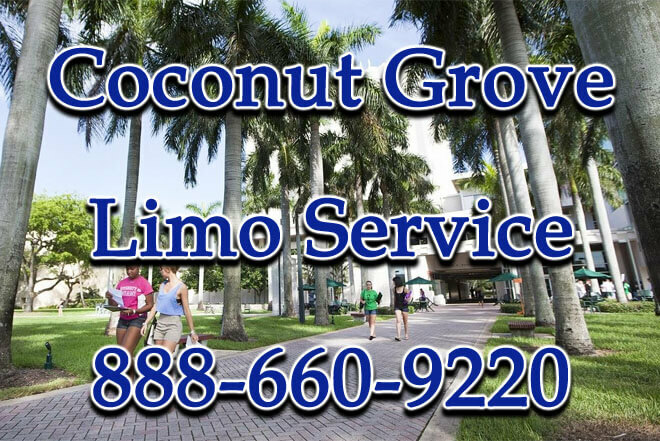 Limo Service Coconut Grove, FL. Coconut Grove limo service will have you riding in style with your friends and family. We can provide you with transportation service throughout Miami-Dade County. Our limo service in Coconut Grove provides transportation service for weddings, airport transfer, anniversary, bachelor party, birthday, night on the town, sweet sixteen, quinceaneras, corporate events, and more. Coconut Grove limousine service has luxury vehicles for hire on our website to help you make your decision process a lot easier when making a reservation. Visit Price 4 Limo and get a quote within seconds on any of our vehicles for hire and celebrate in style. With our limo service in Coconut Grove you can enjoy the ride to your destination around the city whether it is a sporting event, corporate event, or celebrating with friends and family. Preview Coconut Grove Limo and Party Bus Fleet. Limo service in Coconut Grove, Florida provides you with a variety of vehicles to choose from in our photo gallery section of our website. Check out our library of vehicles and make the decision process easier as you make your final decision on which vehicle you will like to reserve. When you reserve any of our Coconut Grove limos on our website you can plan your reservation any way you wish. For example if you are planning a one way trip, three hour reservation, or seven hour rental our Coconut Grove limousine service will have you riding comfortably in our vehicle. 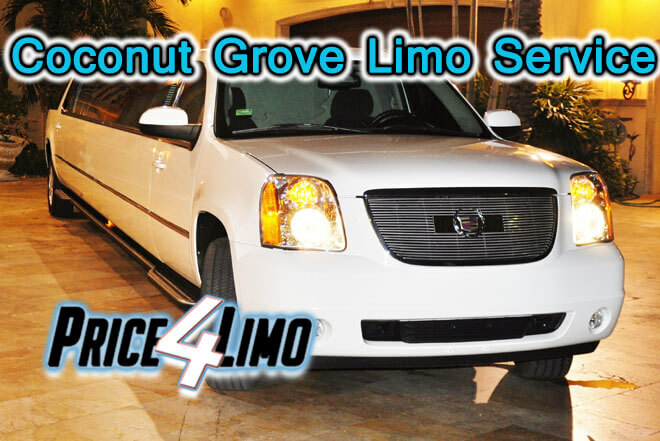 Coconut Grove limousine service has a fleet of limos to select from available on our website. Reserve a Coconut Grove Zebra Hummer Limo and celebrate in style a bachelor party, wedding, bar crawling, night on the town, homecoming, and more. With our popular Coconut Grove Pink Hummer Limo you can count on the ladies selecting this vehicle a majority of the time. Celebrate a ladies night on the town, bachelorette party, birthday, divorce party, sweet sixteen, or quinceanera. When you reserve any of the Hummer limousines enjoy the ride with one of our 14 to 22 passengers as we arrive to your destination. Another popular vehicle that grabs the attention of the ladies is the Coconut Grove Pink Chrysler 300 Limo. Sit back and watch a DVD or local programming and enjoy the surround sound system as all of the 10 to 12 passenger enjoy the ride. Ride in our popular Coconut Grove White Excursion Limo that sits up to 20 passengers and gives competition to our Hummer Limousines on size. Ride comfortable inside and watch a local program or DVD on the large 42" television screen. Our White Excursion has a variety of screens throughout the vehicle making it easy for anyone riding in the vehicle to view what is being displayed on the large monitor. Coconut Grove Limo Service will pick you up and take you to your destination and anywhere around Miami-Dade County, Florida. Make plans to check out the Miami Hurricanes and Miami Dolphins at Dolphin Stadium. Check out a home game on the Miami Heat in the American Airlines Arena as you cheer for your favorite local teams. 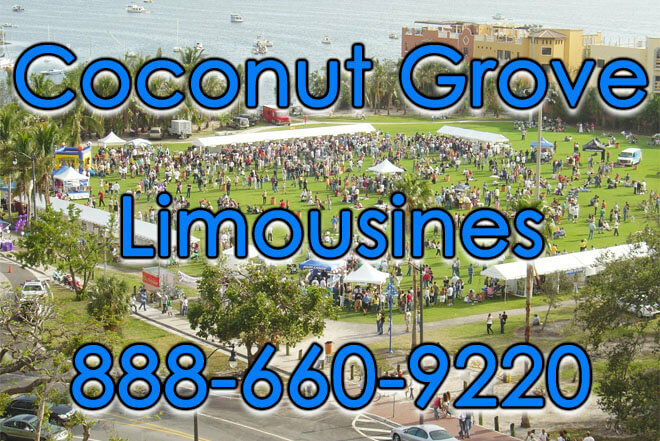 Reserving any of our Coconut Grove limousines and we will take you to some of the hottest clubs around town such as Vision Night Club, Cabana One, Club Space, Club Sugar and more. Have us pick you up in a Coconut Grove Escalade Limo that sits around 10-12 passengers and celebrate the night away in Downtown Miami, Sunrise Harbour, Key Biscayne, and more. 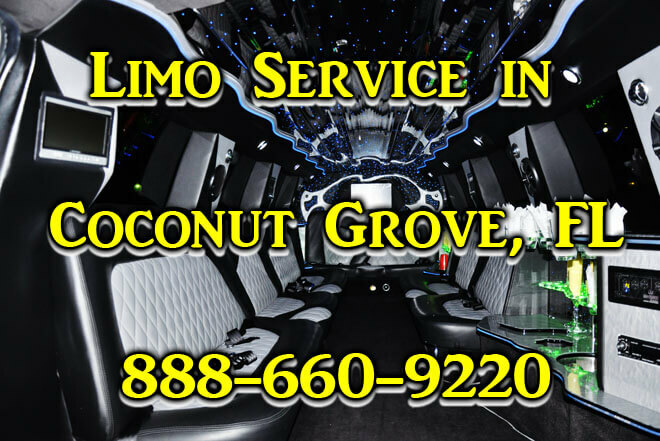 Ride in our Coconut Grove Navigator Limo and sit up to 16 passengers in our vehicle with leather interior seating and a surround sound system in which you can bring your MP3/IPOD player with you and listen to your own custom playlist. Celebrate a birthday, wedding, anniversary, birthday, sweet sixteen, quinceanera and more. The Coconut Grove Rolls Royce sits up to 10 passengers will have you riding like a rock star or celebrity as we get you to your destination. All of our Coconut Grove limo services will have you arriving in style especially when you are riding in our Coconut Grove Lincoln Stretch or even our Cadillac limo in Coconut Grove, both vehicles sit up to 10 passengers and make planning easy when you are out and about. Have us be your designated drivers for the evening or even your tour guide as you make your way through the city and travel in style in one of our Coconut Grove limousine as you enjoy the city in ways you only see on TV. Coconut Grove limo service also provides you with Airport Transportation service in Miami-Dade County, FL. Whether you are departing from Miami International Airport or arriving from a long flight our professional chauffeur service will be there to provide you with the transportation service you need. We provide you with on-time pick up upon your arrival so you can make it a surprise for everyone when the vehicle that picks them up from the airport is a luxury limousine. Have us provide you with transportation service from Coconut Grove to the airport so you arrive early to deal with the potential long lines that could delay your arrival to the gate. Coconut Grove limousines also provides you transportation from Miami Airport transfer to Port of Miami so you can get from one location to the next and get ready to begin your cruise and continue or even begin your vacation the moment we drop you off at Port of Miami. Coconut Grove Limo Service provides you with a variety of vehicles to choose from on our website Price for Limo where you can get a quote within a few seconds. Celebrate any occasion with your friends and family such as a wedding, night on the town, birthday, corporate event, anniversary, divorce party, seaport transfer, airport transfer, bachelor party, and much more. Coconut Grove limo rental will have you riding comfortable in one of our many limousines as you enjoy the ride and have everyone smiling from ear to ear as they ride in a limousine either for the first time or the second time.